I'm first. Hope I win! I'm a follower. You've offered a lovely prize. Lovely items. I'm especially fond of the bucket. Have to go check the fall decorating inventory! Hello, my friend! What a generous giveaway. 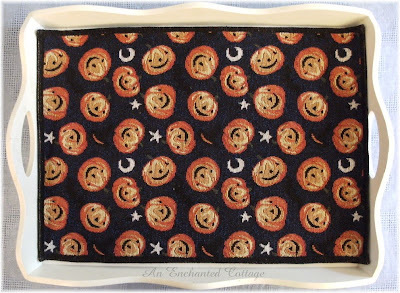 I love how you put An Enchanted Cottage on the side of the tray...have you thought of doing that for real? It would be awfully pretty! Sign me up for this giveaway...I already am a follower and I will let you know when I put your button on the blog. By the way, you might want to read today's post...I put something on there just for you. What a cute give away. Enter me. What an awesome fall giveaway! I don't know why I wasn't a follower, I love your blog and its even on my blogroll! Please add me to the hat, I would love a chance to win! Love your giveaway, count me in! Super sweet give away! I am a follower, thanks! And I will put you on my side bar now! Fun, nice things...like those birds! Love your giveaway....count me in!!! OK, I know you know I really really want to win this one! Everything is so cute. So I'm putting your blog button on my side bar. I'm also a follower. But, sadly I way to busy right now to go put together a lovely fall giveaway. Though it has been awhile since i've had one. So I guess three entries for me will have to be enough. What a great giveaway. Crossing my fingers! I'd love to be included in your giveaway! I posted about fall today too--all my favorite fall colors! Nice giveaway ~ Hope I win! Love your blog that street performer was something else huh? Gee I thought it was a halloween decoration outside a store. The give away is full of beautiful treasures I am sure whoever wins will be blessed. Just found that you are doing a give away. Count me in. Thank you! I will return to become a follower...Blogger is messed up right now. I just included your give away with your link in my sidebar. I am also doing a give away. I'll email you when I can. Email is currently down. Yeah! It's finally Autumn! Please enter me in this giveaway. Good luck to everyone! What a great giveaway! I love the white pumpkins and the little birds!!! I haven't even started thinking about Autumn yet because it's in the 90s here! Oh yes please, I would love to enter your lovely autumn giveaway!! I'm a follower and I love this giveaway!! Right when you have a Giveaway Happening! I will be back to read more older posts soon! 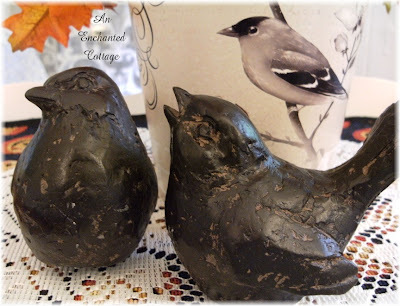 What a lovely giveaway and a lovely blog. Please count me in. Have a wonderful Wednesday! Hi, What a lovely giveaway and sooo generous of you! Please enter me in and stop by my blog sometime. What a beautiful combination of treasures for a giveaway! I would LOVE to win! Thank you so much! I put the giveaway icon on the sidebar of my blog! And I am also a follower! Thank you! I love the white pumpkin, but the birdie on the bucket is my favorite! 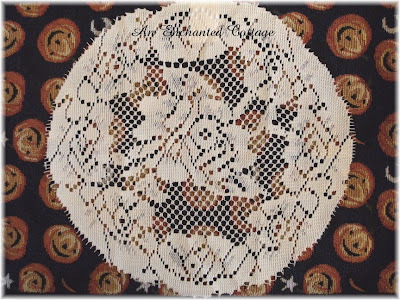 I've started following you, love your ideas and decorations. Wish I had a "Christmas Tree" shop in my town! Thanks for the giveaway opportunity! Oh, what a wonderful giveaway. Love your blog and just became a follower. I love, love, love the bucket with the bird on it. Everything is just adorable..Livig in Florida, but being from Ohio..I miss the changing colors of Fall. Darling! I love fall. Please enter me! Great giveaway! I love these cute fall decorations! Great giveaway! Love, Love the Fall! We're planning on getting up to Vermont the first week of October and I can't wait! BTW I've grabbed your Fall icon to put on my site and notify my folowers of your great blog! Hi Donna, I want to be entered in your wonderful give away too! I think I am a follower....if not I will be! 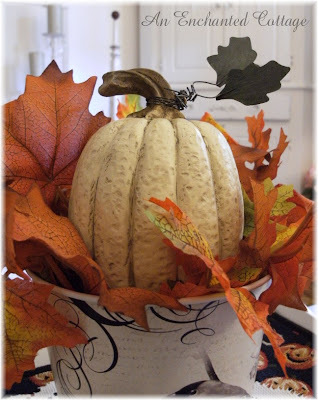 What a beautiful way to add some autumn to your home! Something tells me I'm gonna win! lol! your so lucky to be having that cool or shall I say cold weather, I'm so excited for fall!! are an animal advocate. :) Please enter me in your lovely giveaway! This is so much fun. I am posting a comment. Please enter me into your give away. Love all the critters in the scroll bar. Such a wonderful love for animals too. What a wonderful giveaway! thansk for the opportunity! I just signed up to be a follower! Oh, how I love fall, and fall decor. Glad to participate in your giveaway. 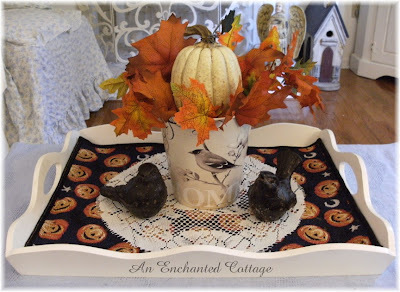 What a lovely falltime display-I would love this for my front entry table! Hello! 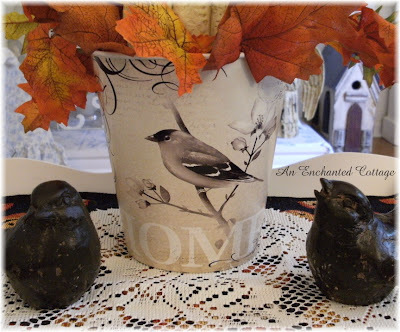 Your inspiration got me to pull out my hatbox of "fall stuff" to toss around the house -- actually it will probably start on the usual places (table, mantle, etc) ... but often ends up elsewhere. To save time I should just toss it around to begin with, lol! Hugs and have a super day! Hi, I found your blog today. Please, enter my name in your giveaway. I am now a follower. I'm adding your giveaway to my sidebar too! Wonderful giveaway, please enter me! I am a follower (Lov2Crochet) too. Thanks~! Ooh! A giveaway! I'm so excited. I love fall. It is my favorite season! What a lovely giveaway! Knowing winning isn't ever my possibility, could you maybe share who made that lovely little bucket with the bird? We dont have that shop here so hope to find it maybe somewhere. You have a lovely blog. I signed up as a follower and hope you come by and do the same. Love your fall giveaway my favorite season please enter me I just became a follower thanks! You have some very crafty ideas, Donna. I never entered a "Give Away" before. oh my, would love to have any of the things shown. I am so into white pumpkins this year! Just beautiful...the birds are adorable! Your give away is too cute, the little birds are fantastic!! Please enter me in this great giveaway. I follow as well! I found you just in time. Now off to see more of your wonderful blog. I forgot to mention how great i think your prizes are!! What a lovely autumn giveaway; thank you for hosting it! I love Fall, count me in! I will grab your button and link it back to you. you also gained another follower, even though I didn't make it before Sept. 29.